"Growth as an economic engine must necessarily have limits when the natural assets are what drive the economy." For more on the VCS perspective, see the cover story of our most recent print newsletter. Sunday, Jan. 22, 4:00 pm, Edgartown. Documentary film One Big Home, an exploration of the issues -- economic, cultural, and personal -- surrounding the proliferation of huge houses on Martha's Vineyard, is now showing every other Sunday at Edgartown Cinemas. Saturday, Jan. 28, 3:00 to 5:00 pm, West Tisbury. Experience all four seasons of Cedar Tree Neck Sanctuary in just two hours with this armchair tour. Staff from Sheriff's Meadow will share the beauty, history, flora and fauna of this popular nature walk through a multimedia presentation geared toward all ages. At the West Tisbury Library, free, for more info see website or call (508) 693-5207. Saturdays, 10:00 am - noon, MWF 2:00 - 4:00 pm, Vineyard Haven. Re-use beats recycling any day! "Clothes-to-go" provides free gently-worn clothing to those in need. At the Stone Church in Vineyard Haven (map), call (508) 693-4424 for more info. 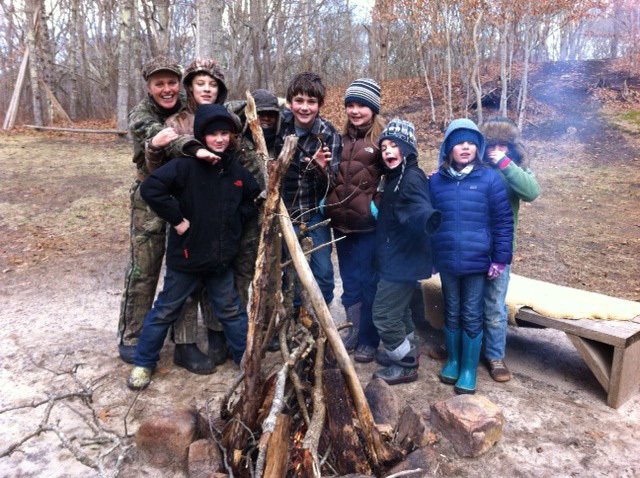 Build connections to nature and outdoor skills that will last a lifetime. This winter, Sassafras offers a program for kindergarteners on Fridays in addition to their long-running Saturday Squirrels and Coyotes for older kids. For pricing and more info, see website or call (508) 645-2008. Over the next month, VCS will be bringing a film and discussion series to the Oak Bluffs Library to raise awareness about waste issues. Few would ever notice that the average American produces 4.3 pounds of trash per day – 90,000 pounds of trash in a lifetime – because our waste removal system is so efficient that it’s not something we have to think about. But we should think about it. Invisible doesn’t mean unimportant. So please join us to learn what simple things we can all do to make a difference. Films will be followed by discussions and feature zero waste snacks to highlight packaging-free and homemade options. Also, everyone in attendance will be entered in a raffle to win a collection of reusable items donated by Cronig’s Market. This documentary examines the role of the bottled water industry and its effects on our health, climate change, pollution, and our reliance on oil. 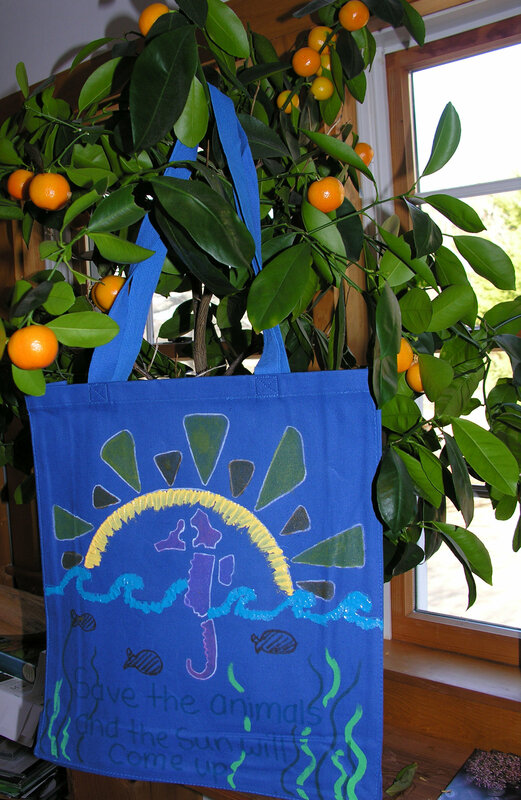 This winter, every student at the Oak Bluffs School has received a reusable canvas bag to personally decorate during art class. 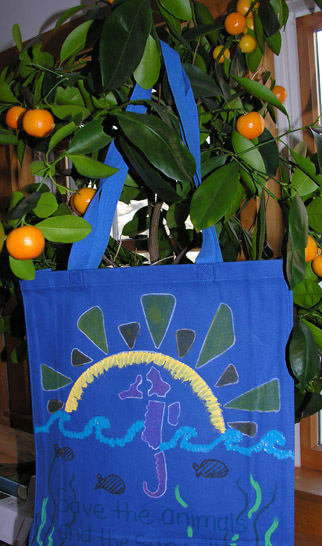 VCS has done this kind of bag decorating activity with kids before (see 2nd story here), but this time there's a twist: the bags will be donated back to the community to help encourage the BYOB lifestyle. Many thanks to art teacher Kim O'Connor for helping make it all happen! The bags will be on display at the O.B. Library during the film series described above - another reason to come check it out! Join VCS for a special collaboration with the MV Film Society: a screening of the new documentary A Plastic Ocean, in which an international team of adventurers, researchers, and ocean ambassadors go on a worldwide mission to uncover the shocking truth about what is lurking beneath the surface of our seemingly pristine ocean. The screening is this Thursday (Jan. 19) at 7:30 pm, at the Film Center in Tisbury Marketplace. For tickets ($15, $12 members, $7 children) see MV Film Society, and for much more on the event see the story in the Vineyard Gazette. Co-sponsored by Norton Point, maker of sunglasses using recovered ocean plastics. A portion of the proceeds will be donated to VCS.